Holiday Cottages in South West & Channel Islands. View details for H601 - Burton Bradstock in Dorset, Dorset. Provided by Holidaycottages.cc. 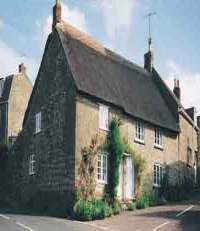 ... in Burton Bradstock, end on to the B3157 (particularly busy in summer), Dormouse Cottage (c1610) is tiny; Grade II listed, traditional Dorset thatched, stone built, and a stone's throw from two pubs (both Âgood foodÂ). An easy walk to the beach (sometimes sandy).